Countless stories of survival have been told after the awful havoc wrought by Hurricane Katrina in late August 2005, including one about a rose that has become a worthy symbol of the spirit of New Orleans. Peggy Martin, a famous rose gardener and former president of the New Orleans Old Garden Rose Society, lost her home in Plaquemines Parish and her entire garden—including 450 old roses she had painstakingly collected over the years. For two long, horrible weeks the toxic stew, 20 feet deep, spewed by Katrina covered her home and garden. After the waters receded, Peggy returned to a decimated garden. Only two plants showed signs of life, a nameless rose and a crinum lily. She had received the unnamed rose as a cutting from a friend who in turn had received a cutting from her mother-in-law. Peggy Martin didn’t have the heart to return to Plaquemines Parish, so instead she and her husband settled in Gonzales, LA, a town near Baton Rouge. She took cuttings of the rose with her. Today this passalong plant, symbolic of New Orleans’ resilience, now bears the official name ‘Peggy Martin’. This is a rose that loves to climb. 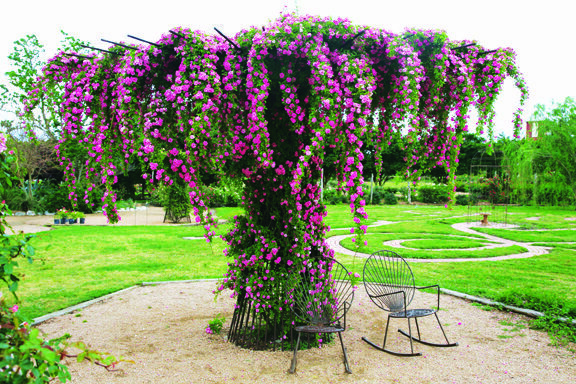 In 2011 the Antique Rose Emporium featured the rose on the cover of its catalogue. This created quite a stir, as the rose is spectacular. 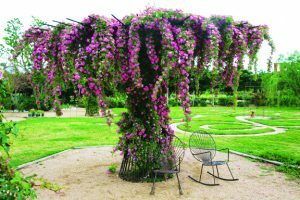 I quickly ordered one, planted the rose inside a circular trellis, and watched it grow fifteen feet in one growing season. However, there was nary a flower. I’m not a heavy user of fertilizer, but the green growth caused me to wonder if the rose was receiving too much nitrogen, which promotes green growth at the expense of flower production. Upon conferring with the Antique Rose Emporium, I learned this was a normal growth pattern and the rose would start to produce flowers most likely during the second summer. This year at the end of April it was blanketed with rose buds, followed by at least 1,000 pink blossoms all at once. I do not exaggerate. The rose blooms, each of which is the size of a half-dollar, appear in clusters of eight or ten—and the plant was covered with masses of clusters. Truly this rose is a showgirl of the garden. Since it lacks thorns, the canes are easily trainable. I found using Velcro gardening tape helped to hold them in place until they developed sturdiness. ‘Peggy Martin’ will take a break—a much-deserved break I might add—during the heat of the summer only to put forth new blooms in the fall when the temperatures fall. If you believe roses belong in vases, then this is not the rose for you. Generally speaking old roses are not suitable for a cutting garden, but they have other redeeming features: they do not require extensive yearly pruning, blackspot does not decimate the shrub (yes, ‘Peggy Martin’ gets an inoffensive touch of blackspot), and they do not require continual spraying. Like all roses, ‘Peggy Martin’ appreciates a touch of water and a little fertilizer. Alas, the only fault is that the blossoms carry no scent. Though ‘Peggy Martin’ is not currently available in the Triangle, several local garden centers are planning to offer the rose next spring. Until then, the rose is available through several online mail order sources—but talk up ‘Peggy Martin’ to your local garden centers and let them know you want to buy one. Trust me, this is a rose you’ll want in your garden. To read more about Peggy Martin’s story, visit www.peggymartinrose.com.